The old Lesher house and addition. By way of marking the fiftieth anniversary of the Academy of the New Church, this little book aims to convey an accurate impression of the early spirit and the present position of the Academy Schools. Although not intended in any way as a formal history of our beloved institution, the materials and photographs here embodied will be of service to the future historian. The present year concludes the first half century's labor by the Academy to establish New Church education on a permanent basis. Those who are now engaged in the work are devoted to the cause and confident of its future. Their faith, like that of their fathers, is based not only on a clear perception of the need, but also on the conviction that a new religion calls for and must of necessity produce its own distinctive education. 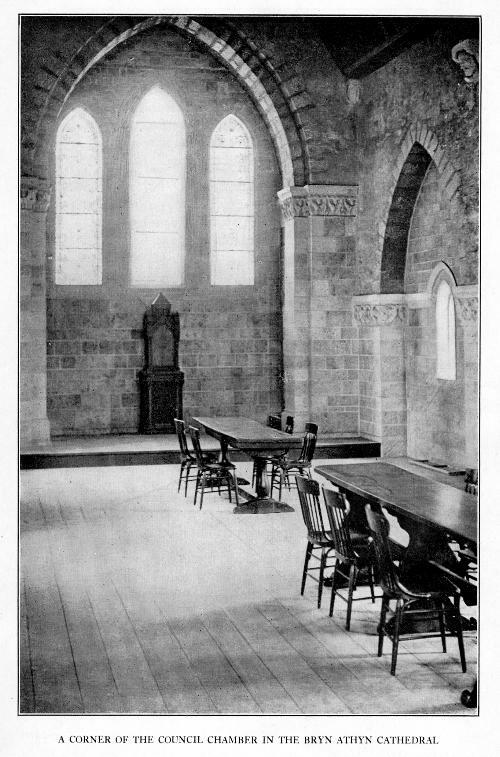 If there has been a question in the Church at large as to the propriety or feasibility of New Church schools, and certainly the work of the Academy in this respect has from time to time been challenged, the question refers to the deeper one, as to whether we have in the Church a new religion of such a nature and difference from the old as to call for new formations of spiritual thought and affection. If so, it follows that an education must develop which will concord with the new doctrines, and the better prepare the minds of the young to receive affirmatively the great truths of revelation for which the Church stands. Both of these questions under varying aspects have engaged the attention of the Church for many years, and differences have developed which have divided the Church. The primary question as to the nature of the new religion, and its difference from the old Christianity, can only be determined as a matter of interior conviction by a study of the Writings. By inquiry into the claims of the New Revelation and trusting confidently in its teachings, we may with good reason anticipate that the New Church is destined to stand unique among the bodies of Christendom, on a plane of spiritual thought and affection apart, enclosed within its own borders, not indeed in prideful isolation, but with a view to exalted spiritual service, imparting, by virtue of its existence, invisible support to all that is good and true in both worlds. There is, however, another way of looking at the subject which discovers a severe contrast. When we consider the wonderful promises concerning the Holy City, its Divine descent, and its bridal relation to the Lord, the thought arises as to whether this glorious marvel can be represented by and comprised within the present meager body of the Church. Can we measure the "City" and test the verity of its descent by the feeble societies now on the earth, societies few in number and of hesitating reception because of doubting minds and vacillating states? And is not our discouragement increased when we realize that this little Church seemingly refuses to grow, its children become cold to it, and its grandchildren forget the religion which by right of inheritance should be theirs? How can a body which has encountered such a fate through several generations hold up its head and claim the right to its title? How can such poverty in results give warrant the assumption of the Church to be the new and true Christian religion, and whence comes its daring to attempt, with so feeble a hand, the work of inaugurating a new education ? Those who are of the Academy hold that it is just because of the difficult establishment of the Church in the world at this day that we must educate our children in the Church. It is our hope that the Academy may, by its works and fruits convincingly demonstrate, in a practical way, that the means have indeed been found whereby the Church may, in large degree, be saved from the heretofore appalling loss of its young people. In any case, it can be said that the Academy workers after a half century's labors are more than hopeful, they are confident. Slow but steady progress has been made during the past years, and it may be affirmed that the future of our work, especially in the matter of numerical growth, was never more promising than at the present time, and, what is more important, there are indications of a considerable advance in the development of distinctive methods of education. Fifty years have passed since the work began. Measured by the world's standard of progress we may not boast. Our small but steady gains are to us, however, supremely indicative. We have been guarded from any grave disappointment by our Academy, training which forbids grandiose expectations. Besides, we believe that the thing we are engaged in building can best grow slowly, can only grow slowly, and under Providential guiding, rather than by our forcing. So we are content, not to rest from our labors, but to wait on Providence, with the steady conviction that success will be given, in the degree that we have prepared an adequate and protective basis of reception, a fit containant, without which spiritual influx cannot be held, and natural growth will be in vain. In celebrating the year's jubilee, we feel that the workers of this first half century in the cause of New Church education have been greatly privileged, in that it has been given them to take part in the beginning work of founding a spiritual citadel, a stronghold for the New Church, an ultimate institution devoted to a Divine vision drawn from heaven, which in its own time will move the world to its acceptance. In the following pages a brief history of the Academy's work from its beginning will be given by those who have supervision over its several departments. 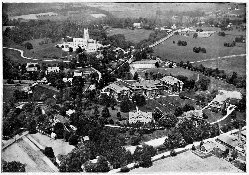 The body known as the Academy of the New Church was organized in the City of Philadelphia on the nineteenth day of June, in the year 1876. The men who were responsible for that organization, twelve in number, acted under the leadership of William Henry Benade. These men, with one exception, were members of the General Conventions. There was no thought in the minds of the men who organized the Academy, or wish, to separate from the existing bodies of the Church. The one thought and desire was to work with them for the upbuilding of the New Church in the world. The thought of separation came later under the stress of a necessity not foreseen. For the early members of the Academy cherished the hope and expectation o being able to continue to work with the bodies of the Church then existing. We were convinced that we had a :mission to perform and a message to give, a message which we believed the majority of New Churchmen would receive when rationally presented. We had come to see something new in the Writings but little realized before,-a glad message which would be gladly received. There was a sincere belief that members of the New Church in America, in England, and in the world at large, would be able to see what we saw in the Writings, namely, that the Lord Himself appears in them in His Second Coming, speaking to the New Church and teaching that those Writings are the very Divine Truth itself, the very Word of God; and in addition that the men of these bodies would see clearly with us what revelation teaches concerning the vastated state of the Christian world-that few of a mature adult age will ever be willing to see the light of the new truth now given to mankind; that His new light will be received, and can be received only by the young or those as yet in the spring of early manhood, before the formative period of life is passed. For the Doctrine teaches and experience has shown that few in a ripe adult age will receive the truths now revealed from heaven. Therefore we must look elsewhere for a spiritual supply. It was therefore decided to address the Church on these two fundamentals of Revelation, involving many important particulars; and so an internal propaganda was determined upon, and announced by the Chancellor as the policy of the Academy-a phrase frequently used at that time by him in addresses, and in the inauguration of members into the body, and accepted by all its members with enthusiasm, as expressive of the hope of a unified upbuilding of the New Church on earth. With this in view it was decided to publish a Serial, which was to be issued only at stated times, or whenever material should be ready. The name and title of the new Serial, Words for the New Church, expressed the purpose in view, and the use we hoped to accomplish for the New Church, as it then existed in the world. The Rev. J. P. Stuart was chosen as the editor of the Serial. But it was decided that the new journal should take on a form wholly impersonal, so that the name of no writer appeared signed to any article, not even that of the editor himself. This policy, after the Serial ceased to exist was continued for a time in the New Church Life, but was finally abandoned, since the conclusion was reached that names of writers have a value to readers and to history; and that little if anything is gained or corrected in avoiding one extreme by going to the other, an error that is not uncommon in the beginning of any new movement. To carry out still further the work of an internal propaganda it was decided to establish a Theological School under the auspices of the Academy, by means of which young men might be prepared for the ministry to become instruments in the spiritual education and renewal of the Church. It was made plain to us that such a renewal was a necessity for the existence of the Church, and that the internal propaganda had in view nothing less than evangelization in the Church itself, to announce to the men of the Church the appearing of the Lord Himself in the Writings of Emanuel Swedenborg; and we believed that we would thus be doing our part in fulfilling what is signified by the angel proclaiming the everlasting Gospel to them that dwell upon the earth. (Rev. 14:6; A. R. 626; A. E. 869871.) We saw this truth, and it was our duty to communicate what we saw, that the spiritual evangel so well begun by Robert Hindmarsh and others after him might be made more complete, with the added experience of a century of study and work in the upbuilding of the Lord's kingdom. A still further step was proposed, a thing the Chancellor of the Academy had in mind for many years, and which others before him had seen as a pressing need, but had been unable to carry out successfully—the establishment of New Church schools, that the children given us by the Lord might be trained and educated in the light of the Heavenly Doctrine, that the Church might not lose but conserve what had been given, and not depend mainly on accessions from without for the growth and increase of the New Jerusalem on earth. Much has been said, and much more might be said, of the success that has attended the work of New Church education under the auspices of the Academy; of the contributions made thereby to the growth and increase of the Church; but it is perhaps too early as yet to estimate properly the spiritual value of the work that has been done. Many additions to our membership from the ranks of the children have been made, who would otherwise have been lost in the wilderness of the world, if we may judge by the experience of the past; and we fully believe that the requirement of New Church baptism as a requisite for entrance into our New Church schools has had much to do with the success of this work. The time may come with increase of members and the growth of spiritual intelligence, that the requisite of baptism will not be necessary; but that it is at present essential to the success of our work there is no shadow of doubt in the minds of those of us who are engaged in it. What the future will bring forth in the provision of a better way had not yet been revealed, and probably will not be for a long time to come. What we see now is that the baptism of all the children before entrance into the school has worked well, and has done much to protect and conserve the spiritual uses of the Church. When a better way is needed it will be provided. But what we did not foresee or wish for came to pass. Separation took place, and we left the Convention with regret. It had become apparent that we could not work together as originally desired and proposed. The historical facts of our withdrawal from membership in the Convention are matters of record, and it is ,not necessary to repeat them here. We had, finally come to see that the step taken was inevitable, and that we could do our work better and in greater freedom as a separate and independent body, and consequently that there was no other course to pursue. It was better to work as a separate body, better for them and for us. It placed us in greater freedom to do our work in our own way, and we believed that the effect would be similar with them. All our experience up to the present time has confirmed this view. And we have as yet seen no reason to regret the course pursued, or any cause to repent of the step taken. At the time of the initial organization in 1876, the Academy decided not to place itself under the control of any other body of the Church, and no report was made of what it had done. In fact its existence as a body was unknown to the New Church public, until it became necessary in 1877 to apply for a charter from the state. This organization of a partially independent body was done in the exercise of a full degree of freedom inherent in the Church or any part thereof; but it ought to be understood that there was in all sincerity no purpose of a complete separation from the bodies of the Church then existing. And it would be an error to assert that such a step without the knowledge and consent of a body of the Church of which we all as individuals were members, was without precedent. We were merely exercising a freedom of action already taken by previous bodies, such as the Swedenborg Printing and Publishing Society in the City of New York, organized independently of the General Convention, some twenty or thirty years before. Still earlier was the organization of: the Central Convention, and there are other examples of a similar kind, both in America and in England. There is this difference, however, that there was no desire in the Academy at the outset to maintain a separate existence. It is now fifty years since the inauguration of the Academy, and nearly all the men and women who had part in that inauguration have departed this life, and the work is now in the hands of others, of some who were not yet born when the Academy had its- rise; and the-early-hope of the fathers that those who would follow them would do the work better than they. were able to do it, is to all appearances being realized. The fathers and mothers labored, and the sons and daughters have entered into their labors. Let us pray that there will be a continued increase of intelligence and wisdom, as the generations pass by; and that the early hope of the fathers and mothers now in the other world may never know disappointment, but that the work begun by them will go on with a never-ending increase.